Alters the IdleObjectS alchemybottle.nif & genericpotion.nif (used in the MakePotion and DrinkPotion animations, respectively) to instead use one of jbvw's excellent Alluring Potion Bottles. All permissions come with the caveat that you must also credit jbvw's original mod "Alluring Potion Bottles v3". Thanks to the Nexus for being awesome. 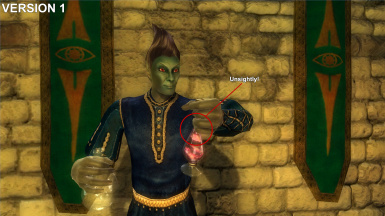 REQUIRES JBVW'S ORIGINAL MOD "ALLURING POTION BOTTLES V3"
UPDATE 06/28/2012: I have added an altered and renamed duplicate of the original mesh which will now replace the default potion bottle used in the potion-drinking animation. This is a quick & dirty 5 minute thing that I threw together today when I realized that I had overlooked it 5 months ago. I'm pretty sure that it clips a tiny fraction of the NPC's hand while held, but I barely noticed. In fact, until I saw Eridor quaff a potion while he sat in The Two Sisters Lodge, I didn't consider this IdleObject at all. 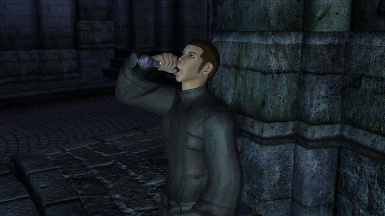 I had to CS together an NPC with appropriate ai just to test it out, due to the fact that even Eridor's propensity for sucking down magic drinks couldn't save him from the wrath of the vampires of Bloodcrust Cavern and I don't have any idea who else could be guaranteed to crack the cap on a Weak Fortify Luck or somesuch. Anyway, as the saying goes, your mileage may vary. There are no changes made to the original replacer mesh. UPDATE 01/13/2012: I have altered the mesh's orientation along its axes to bring it more in line with the original. Thus, no more unsightly clipping. Sorry to those who've previously downloaded, but updating is relatively painless. This is a very simple mod, intended for fellow users of jbvw's "Alluring Potion Bottles v3", which alters the IdleObject alchemybottle.nif to use a slightly-modified version of bottle mesh 01e and liquid texture 1a_e from jbvw's mod. 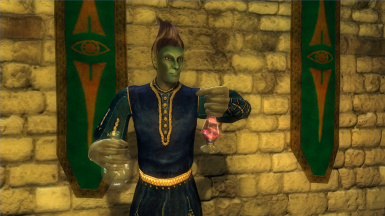 This way, your practicing alchemists will no longer be holding the ugly default pink bottle when performing the MakePotion animation.